Username changes are now closed until the summer. Hi everyone, sorry I'm late with this, I've been quite busy recently and haven't had any time for the site. Name changes will be unlocked this weekend - Saturday 22nd and Sunday 23rd. I've opened the thread now so everyone has a heads up and can ask others for opinions on changes. Just post an answer with the options you're considering, then when this weekend comes you can change your username. To update your username, click your username, then the "Edit my account" button. Or use this link shortcut. 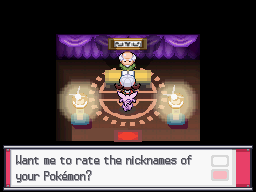 Usernames may not contain 'Pokemaster' in them, nor profanity. Invisible characters (e.g. zero-width spaces) are not allowed. Regular spaces are fine. The maximum number of characters is 20 in a username. This includes all letters, numbers, symbols and spaces. Is it still possible to change my username? September, whay day? The 1st? Depends on when Pokemaster remembers. I +1'd for the grooveh ludicobro. commented Mar 18, 2014 by !'•-Indigo-•'! The Great Deku Tree need to sleep it has been a long time, while he is gone Jofly will take his place. ^ That is the Viking dance. This time I'm serious, my name is now being changed into:─=≡Σ((( つ•̀ω•́)つ Someone needs to do it, and no copying please..
commented Mar 22, 2014 by !'•-Indigo-•'! I personally really like the look and the meaning in this username! Hope you all like my drastic changes! See you soon! answered Mar 17, 2014 by !'•-Indigo-•'! edited Mar 23, 2014 by !'•-Indigo-•'! I don't know how people can decorate their names, I can't even decorate my signature. I tried. Because I'm hawt and dangerous. I've noted the list, and I'm going to be every single one before I leave this site, whether you want me to stay that long or not :D. But for now.. I'm not 100% sure on any name as of now, but I am most likely going to change to Majora. I will update as I decide more, but I'm strongly leaning towards it. It is from LoZ Majora's mask. I like the sound of it, a lot of people seem to prefer JackZero though so I will think about if I should change it at all. Majora is a good one. Yeah. Pretty sure I'm gonna go with that at this point. "answered 500 (or any other number) hours ago by a Magikarp." Get it? No one wants their question to be answered by a Magikarp xD. By the way, I will change my profile picture into a Magikarp when it gets changed. Happy trolling, me. >:( If you change I'm gonna attack you with my (Flare Blitz+Volt Tackle) combo! So don't change!!! Yahoo! Finally another person into Greek/Roman/Egyptian Mythology! Remove the death and just be Thanatos. Nonono. You need '$' in your name. I'm acknowledge more by this now, and I don't want a "Le" name, now that half of the DB went into that phase. You could just be "Scrub". If not then Thrust > Lust. xxblazexx --> Sophisticles of the sophisticated sorts! This'll be my new name. I made this name up back in the 8th grade when my history teacher asked me to name three philosophers we've been discussing. Then the eager "me" said Aristotle, Plato, & Sophisticles, meaning Socrates. :p Thus the sophisticated nature was born. Like it? Thank you all for you votes! And alas, au revoir for now! Thx you Pokemaster! You are now a member of the Ghost Club :D! Blitz of Justice is too long I think. commented Mar 25, 2014 by ! '•-Indigo-•'!